Nico Rosberg immediately dropped to ninth position at the start of the Canadian Grand Prix after being bumped off the track in an early turn by Mercedes teammate Lewis Hamilton. Play nice, boys. 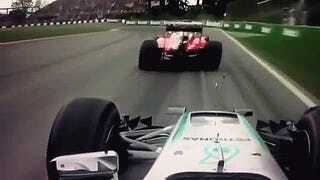 The on-board video from each driver, shown below, shows Rosberg losing the fight with Hamilton in the first turn of the 2016 Canadian Grand Prix. We see Hamilton run wide after Vettel squirts into the lead, leading Rosberg off the track and down to 9th in the first lap. Hamilton has now taken the lead following an interesting pit-stop by Vettel just after the virtual safety car lifted on lap 11.